"Can you teach me how to pump the chest?" the Mongolian nurse asked Anita Rich 81N through an interpreter. 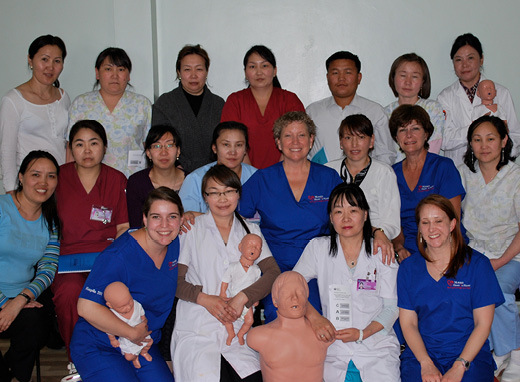 The question came up three years ago during Rich's lecture on airway management for nurses at Third Hospital in Ulaan Bataar. Rich was in Mongolia's capital city on a medical mission with the humanitarian organization Samaritan's Purse. The nurse wanted to learn CPR, a skill typically performed by doctors. "Something clicked," says Rich, who has spent most of her nursing career in cardiac care at Emory University Hospital and now Emory Johns Creek Hospital. "I realized I took for granted something the nurses there didn't do." The nurse's question motivated Rich to form Nurses Heart to Heart, a nonprofit organization dedicated to teaching advanced nursing skills in developing countries. In May 2011, Nurses Heart to Heart sponsored its first trip as Rich returned to Third Hospital with two other nurses to teach CPR. She raised the money to cover their travel expenses and provide three sets of adult and pediatric mannequins to leave behind for nursing instruction. Each of the three U.S. nurses taught five to six students, twice a day for a week. Students who picked up CPR quickly helped instruct others, whose clinical experience ranged from 30-plus years to eight months. On the first day of class, 12 nurses from a remote village arrived and stayed for the week. They now teach CPR in their village using one of the mannequin sets that Nurses Heart to Heart provided. The class, to say the least, was successful. "The nurses loved it and want us to come back," says Rich. "In addition to the hospital, they want us to teach at their nursing school and in some of the villages."